At What Age Do You Vaccinate a Puppy? Puppies that play outside may be at risk of contracting parvovirus if they are not vaccinated. Vaccinations are vital to your puppy’s health. 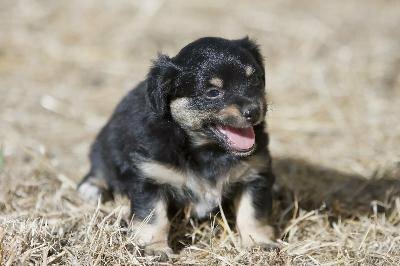 You should begin vaccinating your puppy at 6 weeks of age and provide him with his core vaccines during his first six months of life. However, your puppy’s vaccination schedule may vary based on other factors, such as his size or his dam. Canine distemper, parvovirus, CAV-2 for hepatitis, and rabies vaccines are all core vaccines. They are either required by law or protect puppies from immediate threats present in their environment. The first three are typically given for the first time at 6 or 8 weeks, although the parvovirus vaccine may be given as early as 5 weeks in areas that present extreme risk. The rabies vaccine is not administered before 3 months of age and is usually given after other vaccinations have stopped. Canine measles, parainfluenza, bordatella (kennel cough), leptospirosis and coronavirus are included in the noncore vaccines that your veterinarian may recommend for your puppy. Some of these vaccines may be required for boarding or recommended for dogs that come into contact with a number of dogs from outside the household. Some veterinarians may use combination vaccines that include some of these noncore vaccines. If they are not given with the initial puppy vaccines, these optional vaccines can be given at 3 months of age or later without any negative results. Nursing puppies have what is known as “maternal immunity” to illnesses. This immunity comes from the immunity that the puppies’ dam -- their mother -- has to illness, usually based on her own vaccination history. Puppy vaccinations are given as early as 6 weeks to prevent them from being at risk of illness, because it is difficult to know when puppies stop receiving maternal immunity from nursing. Maternal immunity is usually gone by the time the puppy is 4 or 5 months old, however. No matter how large or how small, all dogs receive the same dose of vaccine, because it takes a certain amount of the active ingredient in the vaccine to make it useful. Regardless, your vet may opt to give your very small puppy its core vaccines separate from its noncore vaccines to avoid overwhelming its system. Small dogs do tend to have more allergies to vaccines than large dogs, however, and the risk increases with the number of vaccines given at one time. If you feel your puppy is at risk of either of these things, discuss the possibility of risk with your vet and ask for an altered vaccination schedule. When Should a Puppy Have its First Shots? When Does a Puppy's Eyesight Improve? When Does a Puppy Get Out of the Nipping Stage? Can My Puppy Sleep in Another Room in His Crate at Night?